This chapter analyses the successful experience of civil resistance of the Peasant Worker Association of the Carare River (ATCC) in the face of the Colombian internal armed conflict. It emphasizes its pragmatic and defensive character, the methods that it has employed and its outcomes. It portrays this experience as a genuine grassroots process led by farmers, which has achieved significant successes through civil resistance in spite of the high level of violent conflict generated by the protracted civil war in Colombia. It also highlights the meaning of this process for peacebuilding and its combination with conflict transformation practices such as mediation in disputes related to the internal armed conflict. This process, which has taken place for over 30 years, made the ATCC worthy of the Alternative Nobel Peace Prize (Right Livelihood Award) in 1991. This chapter is based on extensive fieldwork and uses theories of peacebuilding and civil resistance. 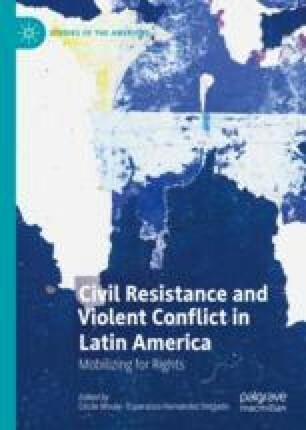 This chapter is the product of a research project in the field of peace research, entitled “Latin American contributions to peacebuilding: Experiences of civil resistance in contexts of violent conflict in Brazil, Colombia and Mexico”, supported by the Office for Research and Transfer (VRITT) of the University of La Salle. It was developed within the framework of the cross-cutting commitment to peace, peacebuilding and reconciliation of the Doctoral Programme in Education and Society of University of La Salle, and is linked to the Research Group in Education and Society of that doctoral programme and the Research Group on Social Work, Equity and Social Justice of the Social Work Programme of the Faculty of Economic and Social Sciences of the University of La Salle. In addition, it was carried out in partnership with Facultad Latinoamericana de Ciencias Sociales (FLACSO), Ecuador.